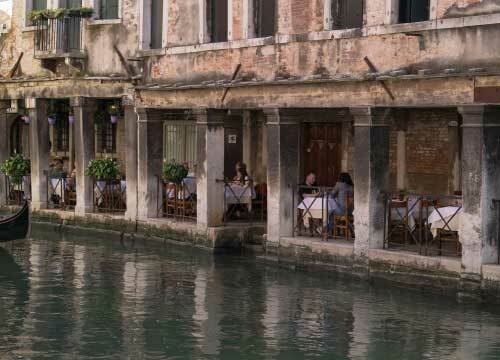 VENICE CAN BECOME THE "DAY TRIP"
Cultural travelers want people-to-people experiences. They are intellectually curious and turned on by simple day-to-day pleasures. They are tourists who want to be locals. They love history. They touch and feel. And most of all... crowds turn them off. Cultural travelers will love Murano.Local guides show how the island culture and history should be experienced. Divertimento Group partners with guides born and raised on the Venice Lagoon islands to create adventures that share the Lagoon culture – with emotions and memories that few visitors to Venice have experienced! This is far from what most visitors see on hurried trips with stops to buy souvenirs. Our cultural travelers will learn about a rich, ancient history of the Venice Lagoon and its 118 small islands connected by canals and bridges. World-famous Murano Glass Maestri will meet with visitors to talk about their childhood on the island and will share stories about their children’s choices to stay (or not stay). Visitors will know them first as Muranesi (born on Murano) and then – as artists. Murano has become a near obsession for Divertimento Group because of the company’s founder’s love for glass art and her friendship with some Murano artists (Maestri) who work hard to fight against the prevailing stereotypes and myths about the island and their craft. The story of the glass masters being sent to the island from Venice so furnaces could pose less of a threat to the city has is well-known among visitors. And the tale of the government’s death sentence (in the 1200’s) imposed on those who left Murano and shared trade secrets with foreigners, though not documented, continues to add to the island’s mystery and intrigue. A new generation of cultural travelers can contribute to Murano’s new narrative. Many of the island’s artists whose lineage goes back generations say: “Basta! (Enough!) Let’s move on to a new Murano narrative.” The Glass Art Society’s (GAS) annual conference in Murano, May 2018 is a great place to start a new chapter. Divertimento Group is a GAS corporate member. We are delighted that Murano will be in the travel/art media spotlight thanks to the conference. We will be there with some innovative designers and artists who will share their positive energy and new ideas about Murano glass. To keep the spotlight on the island after the GAS event, Divertimento Group will be sponsoring “Murano: a new narrative” in November 2018 at the Italian Cultural Institute in Chicago, an event that will bring travel professionals together with artists to showcase glass tourism and talk about how to combat overtourism in Venice by offering Alternative Cultural Adventures. There are many options that await cultural travelers whose ideas of a perfect trip to Venice are not limited to San Marco’s Square and the Doge’s Palace. Murano is part of Divertimento Group’s #RethinkingVenice Program which encourages travelers to focus more on the quality of the visit to Venice – by traveling in off-season or by visiting popular squares and monuments early in the morning or after dinner. Most of all – we encourage travelers to avoid quick touristy visits to the islands for souvenir shopping! Let us suggest living the Murano and Venice Lagoon experience for a few, slow-paced days – by sleeping in one of the small, quaint, family-run hotels whose owners have become like family to us. Divertimento Group’s “Alternative Cultural Adventures” are perfect for travelers who have already been to Venice. But our “Murano & Lagoon Adventure” will also be appreciated by those visiting for the first time, who want to avoid the crowds. Sleeping on the island and waking up to silence (with Venice as the “day-trip” will make a more enjoyable and memorable trip.